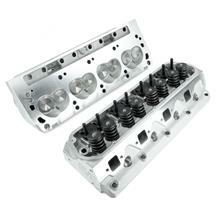 Will these heads work on an 84 351w flat tappet motor? im cuurently running gt40 3 bar heads with trick flow springs and i know they aren't ideal on a 351. While the heads will physically fit, the valve springs are intended for a hydraulic roller cam and will need to be swapped out with a set correct for your flat tappet cam.